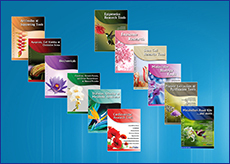 DPP4 Activity Fluorometric Assay Kit | K779 | BioVision, Inc. This kit detects DPP4 activity as low as 3 µU per well. Dipeptidyl peptidase-4 (DPP4), also known as adenosine deaminase complexing protein 2 or CD26 (cluster of differentiation 26) is a protein that, in humans, is encoded by the DPP4 gene. The substrates of CD26/DPP4 are proline (or alanine) containing peptides and include growth factors, chemokines, neuropeptides, and vasoactive peptides. DPP4 plays a major role in glucose metabolism. It is responsible for the degradation of incretins such as GLP-1 and hence its inhibition by drugs such as Sitagliptin have been used for treatment of diabetes mellitus type 2. 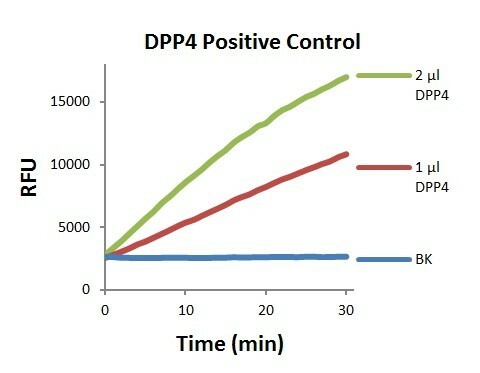 DPP4 also appears to work as a suppressor in the development of cancer and tumors. 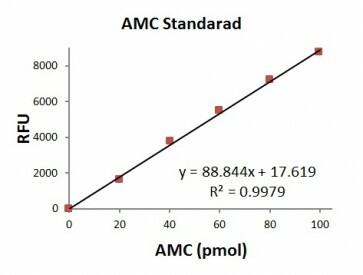 In BioVision’s DPP4 Activity Assay Kit, DPP4 cleaves a substrate to release a quenched fluorescent group, AMC (7-Amino-4-Methyl Coumarin), (Ex/Em = 360/460 nm). This assay is rapid, simple, sensitive, and reliable, as well as, suitable for high throughput activity screening of DPP4. This kit detects DPP4 activity as low as 3 µU per well. Mack et al., Spinal Myxopapillary Ependymomas Demonstrate a Warburg Phenotype. Clin. Cancer Res., Aug 2015; 21: 3750 - 3758. Sanin et al., IL-10 Production in Macrophages Is Regulated by a TLR-Driven CREB-Mediated Mechanism That Is Linked to Genes Involved in Cell Metabolism. J. Immunol., Aug 2015; 195: 1218 - 1232. Kanasaki et al., Linagliptin-Mediated DPP-4 Inhibition Ameliorates Kidney Fibrosis in Streptozotocin-Induced Diabetic Mice by Inhibiting Endothelial-to-Mesenchymal Transition in a Therapeutic Regimen. Diabetes, Jun 2014; 63: 2120 - 2131. Nasib Ervinna et al., Anagliptin, a DPP-4 Inhibitor, Suppresses Proliferation of Vascular Smooth Muscles and Monocyte Inflammatory Reaction and Attenuates Atherosclerosis in Male apo E-Deficient Mice. Endocrinology, Mar 2013; 154: 1260 - 1270.